The cloud IAM space is one of the hottest sectors right now. After almost 15 years of being a stagnant market, all of a sudden there is a resurgence of activity and innovation in the space. The fundamental changes in the IT space are driving the changes, but there are exciting new innovations that identity management providers are bringing to the market. One of these innovations is the cloud IAM feature LDAP-as-a-Service. You could say that the modern identity management space began with the creation of the LDAP protocol. Our advisor, Tim Howes, and his colleagues at the University of Michigan created LDAP in the early 1990s. Subsequently, OpenLDAP™ emerged as a directory service for primarily more technical platforms and applications. Shortly on the heels of the open source identity provider’s introduction, Microsoft released what would become the monopoly in the space, Active Directory®. The market effectively stayed with AD as the commercial market share leader and OpenLDAP as the most popular open source solution for Linux and *nix platforms for a long time. There would be various tools and products that would build upon AD, but none of them had the size, scope, and impact of Active Directory. The directory services market was really an afterthought. Even the introduction of web application single sign-on solutions – now often called IDaaS – weren’t really moving the needle. While Active Directory owned the market, over the last few years, the IT landscape has been changing. Quietly, many IT organizations have been shifting to a cloud IAM platform called Directory-as-a-Service®. There are any number of reasons for the move including the shift to Mac and Linux devices from Windows, cloud providers such as AWS and Google Cloud, web applications overtaking on-prem, WiFi replacing wired networks, and more. All of these changes were rendering Active Directory less effective in the IT network. One of the critical features the cloud identity management platform is LDAP-as-a-Service. OpenLDAP has been known historically to be difficult to implement and manage. While being incredibly flexible, LDAP has generally required a great deal of expertise to install, configure, and manage. As with all authentication services, IT organizations also need to be wary of backup, recovery, security, availability, and more. It’s a time consuming job to manage LDAP in house. With Directory-as-a-Service, a core feature of the platform is a cloud LDAP service. Identities within the cloud directory are federated via LDAP and applications leveraging LDAP can authenticate against the virtual LDAP servers. IT organizations save the headaches of building out their LDAP infrastructure. Instead, they can leverage the LDAP-as-a-Service platform on an as needed basis and pay for it on a variable basis. Those are big advantages for IT and one that they are taking advantage of. As the cloud IAM sector heats up, a core value proposition will be a unified cloud directory service that covers a wide range of platforms, protocols, providers, and locations. 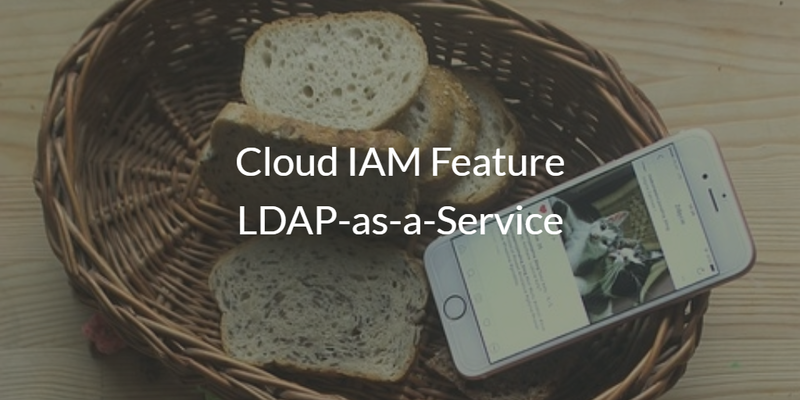 If you would like to learn more about how the cloud IAM feature LDAP-as-a-Service provided by Directory-as-a-Service can benefit you, drop us a note. Or, sign-up for a free cloud directory account and give the virtual LDAP function a try for yourself. Your first 10 users are free forever.